The story of Floyd J. Sweet and his interest in flying began in 1928 in Elmira, NY when he built his first model airplane. The desire to fly prompted his joining a small group in 1929 to build a Dagling Primary which he first flew in August 1930. That was the year Dr. Wolfgang Klemperer discovered that Elmira was an ideal soaring site and where the first U.S. National Soaring Championship was held. This activity inspired Floyd to join a more advanced group which owned a Franklin PS-2. On October 12, 1931, at the age of 17, he made his "C" in this glider with a flight of one hour and twelve minutes. This was No. 45 in the United States. In 1932 he entered the third U.S. National Soaring championships which began a competition career in both National and Regional competitions which lasted until 1957. Sweet received his elementary education in schools in Elmira, and in 1932 matriculated to the University of Michigan. 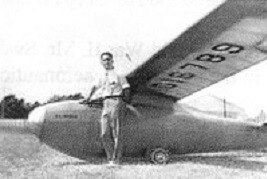 While there, he instructed members of the Michigan Glider Club. He also was a member of the Michigan football and concert bands. In 1936 he received a commission as an Army 2nd Lieutenant and in 1937 was graduated with a Bachelor of Science degree in Aeronautical Engineering. On returning to Elmira, he was made Director of the Elmira Aviation Ground School and again participated in soaring activities in his Rhonbussard. In 1940 he was elected a Director of the Soaring Society of America, Secretary of the Board of Directors and Editor of Soaring magazine. This pleasant period, including marriage, lasted until March 1941 when 1st Lt. Sweet was ordered to active military duty with the Ordinance Corps, his original commission. A transfer to Air Corps in August brought Sweet directly into the military glider program. For a short period he was in charge of training a cadre of commissioned officer pilots in Elmira and later was director of training at the largest Air Corps basic school in California. Prior to reporting to California, he prepared the Air Corps Basic Glider training Manual. In 1943, Wright Field, near Dayton, Ohio, was the next assignment where Sweet served successively as a glider project engineer, experimental test pilot and director of military glider and assault aircraft development. A partial list of his projects includes the CG-14A, FG-1, CG-15, CG-18, CG-20, C-123 and performance testing of a GO-242. 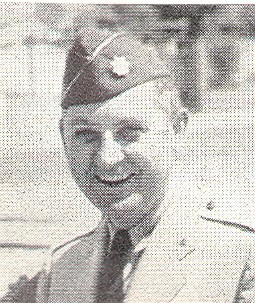 In 1946, Major Sweet was presented the Edward S. Evans Bronze Military Trophy by the Chief of Staff, USAF, for his contributions to the development of military glider and assault aircraft. After graduation from the Armed Forces Staff College in 1952, Lt. Col. Sweet had an extended tour in the Pentagon, first in aeronautical research and development assignments and then as Secretary, Air Force Scientific Advisory Board. In 1954 he was elected President of the Soaring Society of America and served in that capacity for three years. During this period, he attended CIVV meetings in Paris as the Soaring Society of America representative and headed the U.S. Team in the World Championships in St. Yan, France. It was there he attended his first OSTIV Congress in 1956. A transfer to headquarters USAF Europe in 1958 brought Sweet into close contact with OSTIV. He was elected to the Board, participated in the early meetings of the Sailplane Development Panel and was appointed Chairman of the Technical Committee. Returning to the U.S., in 1961, Lt. Col. Sweet retired from the military and joined the secretarial staff of the National Aeronautics and Space Administration in Washington, DC. He was Technical Assistant to the Deputy Associate Administrator for Defense Affairs when he retired again in 1976. Extensive traveling was performed during this period to attend OSTIV Board and OSTIV Congress meetings. Floyd Sweet is an Associate Fellow of the American Institute of Aeronautics and Astronautics, Honorary Member of OSTIV, has been President of the Board of Trustees of the National Soaring Museum, Director of the Soaring Society of America and regularly flew with his local soaring club both sailplanes and towplanes. Floyd Sweet received the Tissandier Diploma in 1971, the Eaton Trophy in 1941, the NAA Elder Statesman designation in 1988, the Exceptional Service Award in 1989 and the Schweizer Award in 2001. He holds Silver #17 achieved in 1938 (international #877). Reprinted from A Quarterly Journal of the National Soaring Museum, Fall, 1979, Vol. 3, Number 4, page 6.